Registrants will receive recordings of both sessions. Do you know how to teach others to play with their dogs? Do you know how to initiate and create great play behaviors? Did you know that behavior that occurs naturally in the play process is very easily trained and brought under stimulus control? Understanding and using play skills and games are very important for dog trainers and behavior professionals. After all play is incompatible with fear and anger and anxiety! Understanding how to teach dogs to play, whether it be with food, toys or neither has a role in our practices. Join Angelica Steinker for this important, simplistic yet grossly misunderstood topic on how to acquire cool play behaviors in pet dogs and how to teach pet owners to engage in play activities with their pets. All dogs can learn to tug, fetch, throw and an assortment of other play activities when the correct training protocols are utilized. Learn how to teach basic play activities like fetch and tug. Understand how to play games using food. Understand how you can play games with your dog when there is no food or toys at hand. Angelica is a published author in the field of dog training and agility. Her books, Agility Success: Training and Competing with Your Dog in the Winning Zone and Click and Play Agility, address the handler of the agility team and the use of clicker training techniques in the sport respectively, and emphasize the importance of playing and bonding in order to train agility behaviors to the highest level. She is on the steering committee of the Pet Professionals Guild. Angelica is also the Director of Training for the national franchise The Dog Smith, America’s only Force Free Dog Training and Pet Care License and the co-founder of DogNostics Career College. Angelica has also been published in the Journal of Applied Companion Animal Behavior and the Journal of Veterinary Behavior, both of which are peer-reviewed professional journals. She has been published in the APDT (Association of Pet Dog Trainers) Chronicle of the Dog Newsletter, Dog & Handler, Animal Trainer Magazine, Dog Sport Magazine, Dalmatian Quarterly, and Clean Run, the dog agility magazine. She is certified by the International Institute of Applied Companion Animal Behavior, and is the co-founder of DogNostics Career College. Angelica is also certified as a Dog Behavior Consultant through the International Association of Animal Behavior Consultants. 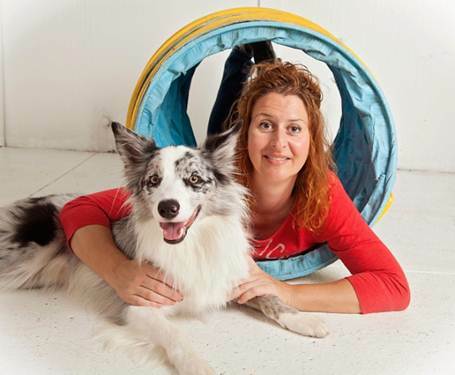 Angelica is a sought-after public speaker who has presented at conferences across the country including the famous Camp Gone to the Dogs in Vermont, the Association of Pet Dog Trainers Annual Conference, BARK Agility Camp, and Karen Pryor's Clicker Expo. Angelica has a Master's degree in Education, which has served as the foundation for her continued certifications in dog training and her extensive understanding of dog behavior and operant and classical conditioning, the science of how animals and people learn.